There is some great surfing in Bali! The best surfing in Bali is found along the southern coast where the swell comes in from the Indian Ocean. Right at the very southern tip of Bali has the best swell. There are many small secluded beaches along the coast around Uluwatu which has large cliff. These beaches are best surfed by experienced surfers as the waves can be quite large. The most popular tourist beachs on the south, Kuta Beach, Legian Beach and Seminyak Beach have smaller waves as they are protected by the Uluwatu headlands. One of the most popular surfing beaches in Bali is called Dreamland. If you have never surfed before then Bali is a great place to learn. There are a number of beaches in the southern part of Bali (Kuta Beach, Legian Beach and Seminyak Beach) which have smaller wavers and a sandy bottem (no rocks or reef) which make them great to learn how to surf. If you are just looking for some quick lessons then head down to Kuta beach any day of the week and you will find the Kuta cowboys, young Indonesian men who hang out at the beach and offer surfing lessons are reasonable rates, around 150,000 Rp for an hours lesson. You can also hire a surf board from them. They will give you some lessons on the sand to begin with, how to paddle out and how to push up on your board once you catch a wave. There are also some professional surfing schools in Bali which will give you more compreshensive training on how to surf. 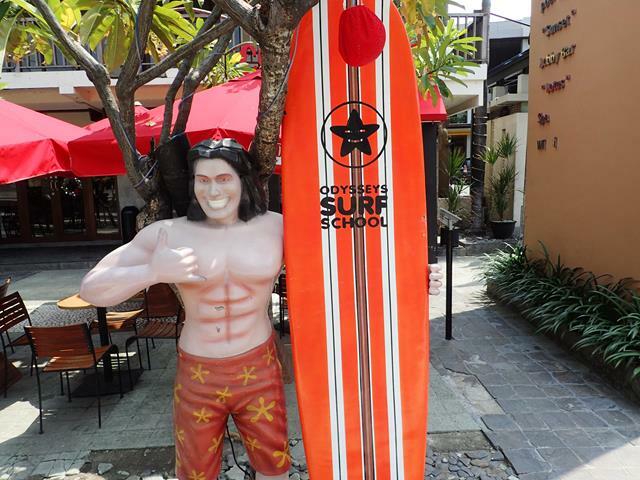 Odysseys Surf School has an office at the Mercure Kuta Beach Hotel located directly across from Kuta Beach. Pro Surf School is one of the oldest surf schools in Bali offering classes for all levels of surfers. Located in Kuta they offer semi-private (small class numbers) and private surfing lessons. Rip Curl School of Surf is located at Legian Beach. Canggu Surf School operate out of The Chillhouse Bungalows in Canggu.